Damn you, Kim Eun Sook! *Shakes fists* How dare you make me want you again, you heartless scribe! After my excruciating experience with Secret Garden (where I went from rabid with want before it even aired and took a straight shot to hell with that drama by the end), I was so ready to write this lady off despite her having written my forever beloved City Hall. But it was a never-ending supply of CH goodwill that kept me leaving an open mind for her, and it looks like A Gentleman’s Dignity might be my new crack after The King 2 Hearts ends. The first teaser trailer is out and I LOVE IT. Love it, love it, love it. 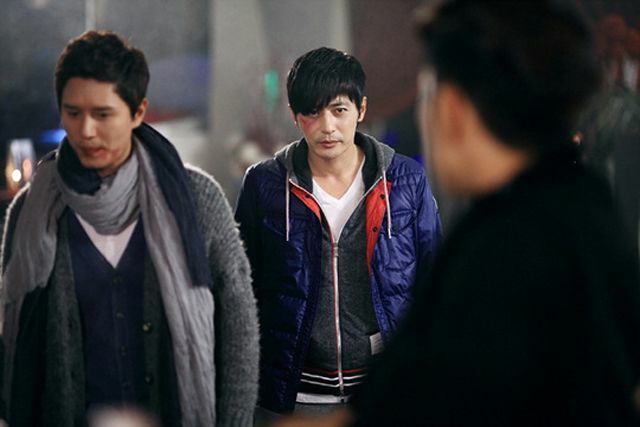 I love the snappy tone, the bromance, and I find Jang Dong Gun and Kim Ha Neul shockingly interesting together. Plus a slew of new stills showing Kim Min Jong and Jang Dong Gun all bruised and battered leaves me even more enamored of a drama that makes forty-something guys act like a school yard clique of frat boys. Bring on the fun, drama! Didn’t understand a word of it, but I’m sold! Bring on F44! I love that I can drool over the men and not feel like a creepy old lady. wow Captain! you got me on this one! im on board yes!!!! Absolutely piqued my interest ever more!! KHN looks rawrrr in that red dress and the ahjusshis look good as well!! And woahhh KES wrote City Hall as well. That was a good one!! While some of us didn’t take to SG I have to admit that it was one of the most famous dramas of last year and it propelled Hyun Bin to dizzying heights of fame. I beg to differ. SG did not make Binnie famous. One needs to already be famous to land a KES drama leading role. Binnie was already famous after MNIKSS, a drama that broke 50% ratings in Korea. When half the households of Korea is watching, he’s made it. SG marked a resurgence of his popularity after a slew of low rated dramas, some of which were critically acclaimed. He was robbed of the Baeksang for FOL. Ms. Koala: I couldn’t agree more with you! I knew HB was famous but thought it was SG that made him crazy famous! I remember prior to enlisting for MS he was being courted to star in many a CFs! I thought what SG did for HB is what MNIKSS did for KSA! Yes Hyun Bin was already famous in Korea after Kim Sam Soon but Secret Garden made him popular among the young crowd…most of my friends got into K-dramas a few years back (ofcourse coz of BOF :P) …so they had no idea who Hyun Bin is…but they became crazy Hyun Bin fangirls after Secret Garden. I saw Kim Su Ro last Wednesday for the recording of the “god of victory” tv show with Shinhwa and 2PM, the latter having him as their leader. He was very supportive, as usual and his manliness was striking compared to the younger guns. The teaser does look promising and less w-t-f-esque than SG. Thanks Mrs Koala. Doesn’t it still hurt? I think it hurts more because of how much we loved CH and how I defended and praised KES to the Heavens. I saw all her weaknesses but the heart was there. Gookie was written masterfully and his jousting with Mi Rae was imbued with so much understanding. Then she dropped the SG bomb on us. Sometimes I talk to Binnie fangirls who wished he never did it, and we compare notes on who hurts more over SG. Truth be told, I too had looking so much forward to KES’s next drama following CH, my first-ever (k)drama addiction. Maybe I should not have expected to go through a similar mind-blowing experience again. I was so disappointed to read about the body-swapping plot and the recaps confirmed my hunch. To this day, I still wonder why the ratings for SG skyrocketed. Maybe my tastes and expectations in dramas do not fit with popular expectations and likings. 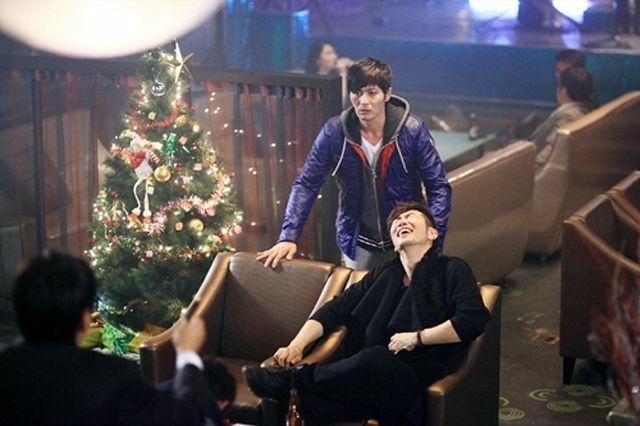 Maybe most guys had a crush on Ha Ji Won and gals on Hyun Bin – or vice-versa. ^^ Or it might have something to do with the gay character which is so taboo in Korean dramas and society. I love Kim Ha Neul and believes that she is one good actress, as of the very moment the gentlemen in this drama hasn’t captured my heart yet ( I say yet, because there are times when i don’t really like the male lead in the drama but once i started following the show i suddenly realized he look good.. i must admit it happened to me several times 🙂 ) But what captures my interest in it is the Cherry Blossom scene and brings me back good memories. But humor button is shining, so this drama might make it to my “Must-watch” list afterall. Jang Dong Gun!!!! It ‘s been a while.. Last drama I saw him is in All About Eve.. Now, after all these years, he become even more handsome!! Binnie was not the first choice for Sega project but I became a Binnie fan because of it. I followed SG because it was a drama KES wrote for my Hyukie in mind, long before Ha Ji Won was cast. When Hyuk was cast and the Ha Ji Won, I was ecstatic, and then I wanted to take a bat to Sidus HQ for insisting Jay Park be given the newbie musician role and when SBS refused, they yanked Hyuk as well, which is how the role went to Binnie. SG is KES’s attempt to turn WHIB on its head by throwing in body swap nonsense to stand for character development. The role of Kim Joo Won was written for Jang Hyuk as a twisted homage to his break out role way back when in Successful Story of a Bright Girl, the rude wounded chaebol heir. I was thrilled Binnie was cast when Hyukie couldn’t do it, because its like switching my left hand to my right hand, I love them both. And in the end, Binnie was the better choice to make Joo Won less odious and loathsome. Hyuk would have turn him into Dae Gil-lite and he’s also 5 years older which makes Joo Won less “cute” (ugh) and more manly (i.e. predator-ish). It’s like WHIB was intended to have JIS’s character be about ten years older, which would have thrown that love triangle into the typical gross rich older man likes younger poor pretty girl dynamic. Instead it was an equal power play between three youngsters confused and tormented. Binnie was the better choice to play Joo Won, despite it being written for Hyukie. In the end, I’m glad Sidus HQ pulled their power play on this one. Binnie had to be coaxed to take it as well, word is his agency wasn’t happy with his predilection for indie and edgy fare and wanted his pre-MS swan song to be a mainstream hit. They got their wish. The first that came to my mind…is this the same place from Lie to Me?? The teaser really captured me. lol I’m usually very lukewarm with Kim Ha Neul, I either like her and than don’t like her the next drama and than like her again. I think in this drama I will like her. As for Jang Dong Gun, man….I haven’t seen him ever since All About Eve. They do make a very cute coupling. Totally watching this. what is the connection between secret garden and a gentleman’s dignity?? Kim Eun Sook! *Shakes fists* How dare you make me want you again, you heartless scribe! After my excruciating experience with Secret Garden (where I went from rabid with want before it even aired and took a straight shot to hell with that drama by the end), I was so ready to write this lady off despite her having written my forever beloved City Hall. But it was a never-ending supply of CH goodwill that kept me leaving an open mind for her, and it looks like A Gentleman’s Dignity might be my new crack after The King 2 Hearts ends. Loved the teaser for a Gentleman’s Dignity. We need more dramas with groups of guy friends who aren’t bullying an entire school. It is sometimes scary how isolated rom-com drama characters are sometimes. Most people I know have a group of close friends to hang out with. As for SG, it was my crack. It was all fun at first and I was obsessed… After all was said and done, I looked back and thought “man, that is one bad drama. Why was I so obsessed? Why did Ra-Im even like Joo-won?”. I think it was a bit like getting drunk. The buzz was fun. The drunkenness was too. Then you hit that point where it’s not so fun anymore – puking and getting kicked out of a club for being too drunk. And then there’s the hangover and regret because the hot guy you thought you made out with was only hot because of the alcohol.